Is it possible to have a crush on someone who died over 60 years ago? Possibly. Among the stories in the first 50- issues of Werewolf, this one – and the Moomins story reprinted in the last issue – would be the most enjoyable stories to research and to write. And since Goodnight Moon is still flying off the shelves and into the affections of millions of children worldwide, it is maybe worth reprinting this account of the creative, willful and tragic life of the genius who wrote it. Right until the final editorial meeting on Goodnight Moon, it remained unclear whether the central character would be a rabbit or – if illustrator Clement Hurd had his way – a human child, perhaps even a black child. In the end, partly because Hurd was better at drawing rabbits than he was at drawing human beings, it was a rabbit child that ended up being in the big bed, in the great green room. 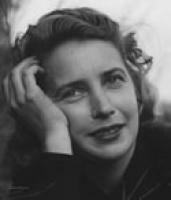 Goodnight Moon is the most famous of the many, many books written by Margaret Wise Brown. During her brief and tumultuous life, Brown all but revolutionised the field of children’s literature. To some extent, this came down to her sheer energy and output. Between 1937 and her death in 1952, Brown poured out a torrent of over 90 books, and at one point had five publishing houses struggling to keep up with her. Much of her impact was also due to the brilliant illustrators that she inspired. Clement Hurd, Leonard Weisgard and Garth Williams for instance, did some of their best work ( The Runaway Bunny, Good Night Moon, Nibble Nibble, The Little Fur Family ) while illustrating her texts. Brown wrote for the very young, and the simplicity of her writing is easy to disparage, yet very difficult to emulate. “At first I read her stories and thought : ‘There’s nothing much to this,’’’ the illustrator Daphov Ipcar once said. “But as I studied the text, I began to see how carefully she had selected just the right word, with just the right poetic feeling, and how beautifully she had woven her ideas and words together.” Well, exactly. There is still an almost narcotic quality to the repetitive rhythms of a typical Margaret Wise Brown story. Often, her books deal with the child’s first attempts at exploration and independence, and finish with a re-assuring flight back to security. The repetitions and most of all, the dreamy ambience have made Brown’s books perfect for bed-time reading – and re-reading – for over half a century. Even wild things need to sleep. Finally, it must be said, Brown’s early impact also owed a lot to her striking beauty, vivacity and air of vulnerability. Bruce Bliven, the writer of a December 1946 profile in Life magazine was clearly smitten with her ‘tall, green-eyed, ash blonde’ sophistication, and with her languid explanation that she spent most of her money on ‘ clothes, champagne and flowers.’ In her diary, Hurd’s wife Edith (also an artist) wrote about Brown coming to visit as if it were the advent of an intoxicating and exhausting angel : “Clem and I always said that whichever one of us was not collaborating with her would have to pacify the one who was….After her departure, we would be exhausted and sleep for days, and then have food for thought for weeks to come.” Brown was, Edith Hurd concluded, the closest thing to a genius that she ever met. Her early death, in tragic circumstances, merely enhanced the legend. 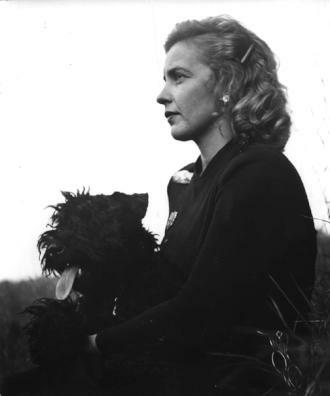 Margaret Wise Brown was born in 1910, the daughter of a wealthy US captain of manufacturing. Her grandfather Benjamin Grantz Brown had been a notable free thinker, a governor of Missouri and the 1872 vice-presidential candidate for what was, at the time, a liberal Republican Party. After a boarding school stint in Switzerland and her parents’ divorce, Brown finished an arts degree in English. As a trainee teacher in New York, she then became the protege of Lucy Sprague Mitchell, a famed researcher in child development who had founded an experimental school of education in Greenwich Village, to put her theories into action. It is hard these days, to realize just what a revolution Mitchell and Brown set in motion. Beforehand, as Edith Hurd says, children’s literature had been largely a field of fairy tales, folklore, adventure yarns and sentimental stories about things whimsically and fabulously unreal. Through Mitchell, Brown became convinced of the need to respect the integrity of the child’s own world – and to treat the child as a little empiricist, engaged in naming and exploring the ‘here and now’ of his or her own experience. Through the process of reading books with their parents, children were to be respected as full partners in the process of learning. To the point where Brown and her associates would sometimes test market their early drafts on children, note their responses and adjust the text accordingly. Like many wealthy young women before and since, Brown got a job in publishing in New York, in a small publishing house set up to market the products of Mitchell’s theories. In short order, the ‘here and now’ movement produced a flood of stories about tugboats, fire engines, ditch diggers and the like, all grounded in the sights, sounds, reasoning and language patterns of the child. To some extent, Brown had also been strongly influenced by the repetitive, modernist prose stylings of Gertrude Stein. As a young editor, Brown had gone asking several famous writers (including Ernest Hemingway and John Steinbeck) to try their hand at writing a book for children. Only Gertrude Stein seriously took up the challenge. The result was a book called The World Is Round, which is still in print. 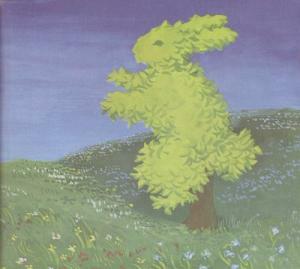 Some critics have claimed the old female rabbit in the great green room in Goodnight Moon was a homage to Stein. For seven years during her 30s, Brown had a turbulent affair with a failed actress and poet called Michael Strange – whom Brown felt to be a far greater talent, and whose poetry she felt, was far more deserving of attention than her own small prose efforts for children. Michael, I have listened to you harder than to anyone in the world and I have heard you. I still listen, and I still hear you. And if my life ever makes any sense who you are even more than what you say will not be lost in me, or in what I write. I believe in you. And I see you, too, being greedy child and pristine child, ruthless pig and generous by your quickness, as few could be. I have seen your self confidence the size of a mouse and the size of an elephant and have seen you in between, and apart from all fluctuations of confidence, love or hate. For Michael is greater than Michael. During the last few months of her life, Brown met and fell in love with Jay Rockefeller, a younger man who seems to have been devoted to her. The couple became engaged. However, while on a publicity tour of France in 1952, Brown fell ill with appendicitis. After routine surgery, her doctor came around and asked her how she was. Great, Brown replied – and demonstrated with a cancan high kick that dislodged an embolism that killed her, almost instantly. She was 42 years old. 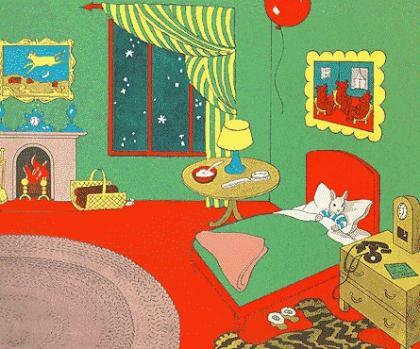 By general consensus, Goodnight Moon was her masterpiece. Marcus was right on the money when he wrote : ‘In Goodnight Moon, Brown was able to convey as well as anyone has, a young child’s liquid view of the world as a place both near at hand and vast beyond measure, toy bright yet shadow tinged, comfortingly familiar yet at times fantastically strange.’ Again, Marcus was right to praise Hurd for the subtle changes in perspective that Hurd creates as he guides us through the remarkably confined location. This is, after all, an entire picture book radically set in just one room. While it has become a cultural landmark, the book took a strange path to that status. On release in 1947, it was a solid but not overwhelming success. For reasons still largely unknown, the book’s popularity suddenly began to accelerate from 1953 onwards. Since Brown had died the year before, this meant she never even suspected the success that her book has since enjoyed. Her will reflected as much. With no children and no big amounts of money seemingly at stake, Brown had whimsically decided to bequeath all of the royalties from her books to Albert Clarke III, a boy in her neighbourhood. At the time of her death, Albert was the cherubic nine year old son of one of her friends from the early days in Greenwich Village, Joan McCormick. Ever since, as “Goodnight Moon” has drifted toward the center of America’s collective consciousness, [Albert Clark] has floated on the fringes of society. No steady job. No fixed place of abode. Dozens of arrests. Rarely has his life traced a path through terrain even remotely resembling the world of Ms. Brown’s stories. Over the years, that world has yielded to him nearly $5 million. Today, he has $27,000 in cash. The other classic book that Brown did with Clement Hurd was of course, The Runaway Bunny, published in 1943. In a small self-referential joke, a panel from this book (depicting a mother rabbit fishing in waders ) can be glimpsed on the wall in Goodnight Moon. For all of Brown’s commitment to the here and now, she based this particular book on a 14th century French folk tale. Essentially, it was a love poem about shape-changing. The basic plot went something like this : while the loved one may change their appearance and wander the world, the pure of heart will always be able to know his or her essence, and will remain faithful until at last, the heart recognizes its true companion. Originally, Brown made her debt to this old folk tale quite explicit in a prologue, dropped before publication. In her version, the shape-changer is the rabbit child, who keeps on moving further and further out into the world, while pursued the whole way by his steadfast mother because …well, because that’s what mothers do, regardless. I know why now, parents keep telling their children to keep warm, and get fat and not to get wet. It is all they can say to express something, poor devils. And yet the Rabbit poet in me has always longed for another language before it is too late – a more fearless boldness of the heart, to say the things we never say, and the other never knows. Footnote : Gordon Campbell is beholden for quotes and biographical material for this essay to the Children’s Literature Review, and the Something About the Author series.